In Honore Daumier’s 1857 lithograph, “Horsemeat For Dinner,” the caricaturist critiques the immoralities acted out by the societal elites in order to maintain their bourgeoise status. The forces in power in 19th century France influenced the consumption of horsemeat on a large scale during the Siege of Paris, symbolizing a loss of humanity through a loss of the ability to distinguish food that is fit for consumption. Though this consumptive anomaly began out of desperation among the lower wrungs of French society, it was borne out of a situation contrived by the pride of the French aristocracy, and it was the people of the upperclass who sustained it out of a sense of loyalty to self-serving nationalistic pride. in fact, this particular piece is part of a series of lithographs by the caricaturist about how Parisian elites playes a role in normalizing this behavior by hosting a well-publicized dinner featuring horsemeat in every dish (Bertleson). Daumier used this event to show how bestial the upperclass was willing to become for the sake of maintaining the status quo. 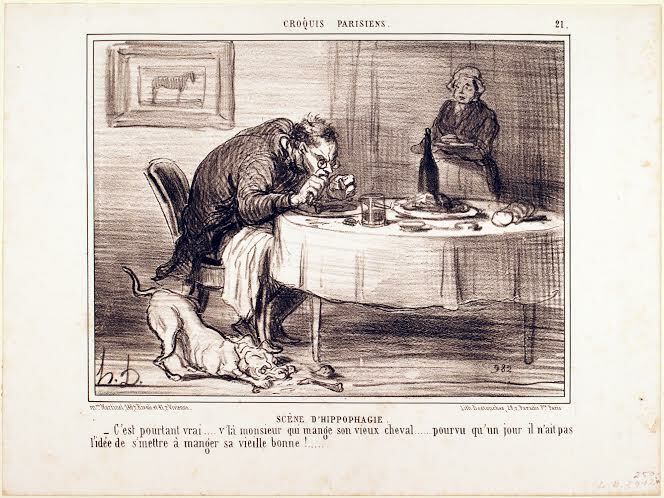 The ability of humans to limit their consumption and differentiate between appropriate and forbidden food sources is part of what the philosopher Leon Kass says is essential to the separation between man and animal—a distinction that Daumier is playing with in this depiction of inhuman hippophagy. Bertelson, Cynthia. ”Eating Black Beauty,* Or, Horsemeat, a Taboo That Became a French Stereotype.” Gherkins Tomatoes. 1 Mar. 2012. Web. 21 Mar. 2015. .